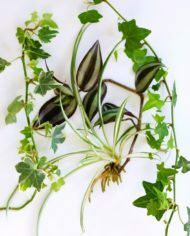 Are you in need of replacement plants for your Hanging Water Garden? We can supply you with a new set of plants for your hanger. What you will receive is a variety of plants sure to include ivy, possibly wandering Jew, and a spider plant. The Variety may vary depending on our seasonal supply. The picture here is an example. The plants you receive will be enough to easily fill one vase. The price covers the cost of shipping and handling to get you a set of free plants.